Monte Vista following their playoff win over Chula Vista High Tech on Tuesday. 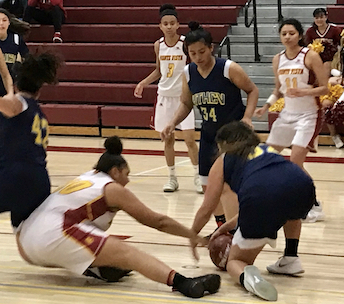 SPRING VALLEY – The Grossmont Valley League co-champion Monte Vista Monarchs won their San Diego CIF Division IV first-round playoff game over the visiting High Tech Chula Vista Bruins, 57-37, on Tuesday night. The Monarchs came out super impressive, building a big halftime lead against a High Tech squad which lost just five games this season. Monte Vista senior SARA TAHA made five three-pointers on the night on the way to 21 points. 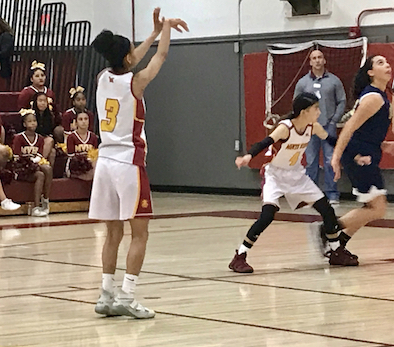 The Monarchs shut out the visitors in the second quarter and MARIAH MOORE made a buzzer-beater shot at the end of the second quarter. “I am really proud of how far my girls continue to push themselves,” Monte Vista head coach SABRINA JIMENEZ said. “I continue to have high standards for these girls because I know what they are capable of. Freshman MEADOW DELINO got her chance to be in the spotlight early, scoring seven points in the Monarchs’ fast-starting first quarter. Moore had six points in the first half. “My guards worked very hard against High Tech’s pressure and took care of the ball,” Jimenez said. “(In the) second half we came out sluggish and our effort slowed down. We let High Tech make a run and we pulled away what we did earlier in the game. The Monarchs really put the game away in the fourth, as Taha hit three three-pointers in the period. Senior TORRI HONORE had nine rebounds, while Barbour grabbed eight boards and had three blocked shots. FOOTHILLS CHRISTIAN 69, ROCK ACADEMY 21 – The No. 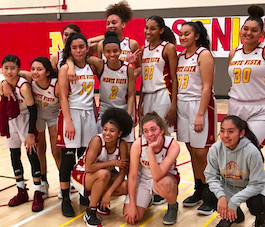 2-seeded Knights won their San Diego CIF Division IV playoff game at Mount Miguel High on Tuesday night. The Knights will meet Monte Vista in the quarterfinals on Friday night. Foothills Christian defeated the Monarchs, 68-60, back on Nov. 30 behind 29 points from junior ELLIE TURK.